The risk of developing varicose veins is 20% if neither parent had varicose veins, 47% if one parent had varicose veins, and 89% if both parents had varicose veins. Approximately 30% of patients with varicose veins will experience an episode of clotting of a varicosity, which is called acute thrombophlebitis. This is usually limited to the superficial venous system and therefore superficial to the muscle layer. 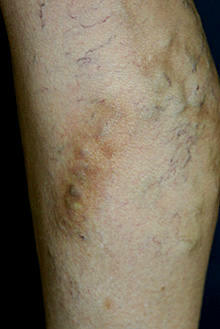 In some situations there is the potential for the clot to extend to the deep veins of the leg, a more serious situation. Symptoms of acute thrombophlebitis involving a varicose vein include pain, tenderness, warmth, swelling, and inflammation in the area of the clot. Anyone suspected of having acute thrombophlebitis should be promptly evaluated by a physician, who should include an evaluation of the deep venous system. A non-invasive ultrasound is usually readily available to diagnose the condition and assess the extent of the clotting.